On 14-15 November EVIA participated at the 8th Motors Summit 2018, which was organised by Impact Energy an NGO that is active in the global standardisation debates, particularly within the International Electrotechnical Commission (IEC), and works closely with several government agencies and other NGO’s including ECOS and CLASP. Impact Energy is also the programme manager on the Electrical Motor Systems Annex (EMSA), under the wider auspices of the Energy Efficient End Use Equipment (4E) which is being funded by the International Energy Agency (IEA) to produce an overarching report with a number of system specific annexes. The 8th Motors Summit saw strong global participation with representatives from regulators, industry, NGOs and academia from our own European sphere able to network and exchange perspectives with peers from the Middle East, the Americas and Asia. Over the years the focus of the Summit has shifted from a focus on the motor in isolation to consider the wider motor system, first by looking at the electrical devices, the drive and the motor package and now by assessing the extended product. In considering the extended product the scope encompasses pumps, circulators, compressors and most relevant for EVIA’s work fans. For EVIA an extended product is by definition a motor driven fan and with the focus of the Summit increasingly overlapping with EVIA’s areas of expertise EVIA were delighted to play an active role in the 2018 Summit as a sponsor and as a vocal participant, in the form of the Chair of our Fans Working Group, Geoff Lockwood. Presentation at the Summit included the Deputy Director of the Swiss Federal Office of Energy setting the scene by noting that motors account for 53% of electricity consumption in Switzerland of which 26% is consumed by fans. Other presentations from market analysis groups, regulators and NGO’s noted that motor energy efficiency standards and regulations are attributing the reduction in consumption across part of the World. 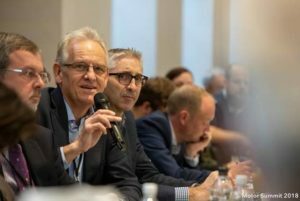 On behalf of the European Commission’s Directorate-General for Energy, Ronald Piers de Raveschoot, the policy officer in charge of the revisions of both the Motors and Fans Regulations, confirmed that the draft revision of the Fans Regulation will not be presented the European Parliament before it is dissolved in April 2019. The intention of the Commission is to answer the comments from the Regulatory Scrutiny Board (RSB) by the end of 2018 and pass the draft through Inter-Service Consultation in Q1 2019. In his presentation Piers de Ravschoot promoted the energy savings potential of the Ecodesign Framework underlining that it will contribute to deliver half of the 2020 targets. For the Commission Ecodesign moving forward is a framework that put metrics in place that enable a systems approach, promotes a cascading approach that enables the efficiency of more complex products and includes an ability to control to react to different loads. As an open question to the industry, NGOs, academics and regulators for future dialogue, Piers de Raveschoot asked who is responsible for the extended product and who ultimately the manufacturer of such products is. From an international perspective, Conrad Brunner representing Impact Energy, explained why standards are important and introduced the IEC initiative of standards for Extended Product and explained that a plenary committee of IEC call the Advisory Committee on Energy Efficiency (ACEE) is working toward an IEC and ISO co-operation. A debate in which it is vital for the fan industry to ensure its representation.